Volunteer bushcare groups in Brisbane work towards preserving some of Brisbane’s greatest assets – our parks and bushland. Brisbane has the highest diversity of mammals and birds of any capital city in Australia. This is largely due to the wide range of vegetation types and habitats in the city. These occur mostly in the form of bushland remnants. Bushland remnants act as lungs for our city. They make the city a nicer place to live in and they provide an idea of what the area was like before it was cleared for housing and industry. Bushcare Group volunteers work together to restore fauna and flora habitat in local parks, remnant bushland and waterways. Volunteers come in all different ages and levels of fitness. A concern for the environment is all that is really necessary. Come along! It’s an excellent opportunity to meet other people in your local community and a fun way to get a bit of exercise. Volunteers can undertake a range activities. These range from administration, through hands on planting and weeding, to contributions of specialized knowledge of plants and wildlife. increasing knowledge and practical skills of members by attending events or activities conducted by Habitat Brisbane, Wildlife Queensland (KBCB-WPSQ), or similar activities relevant to bushcare in MRBC areas. 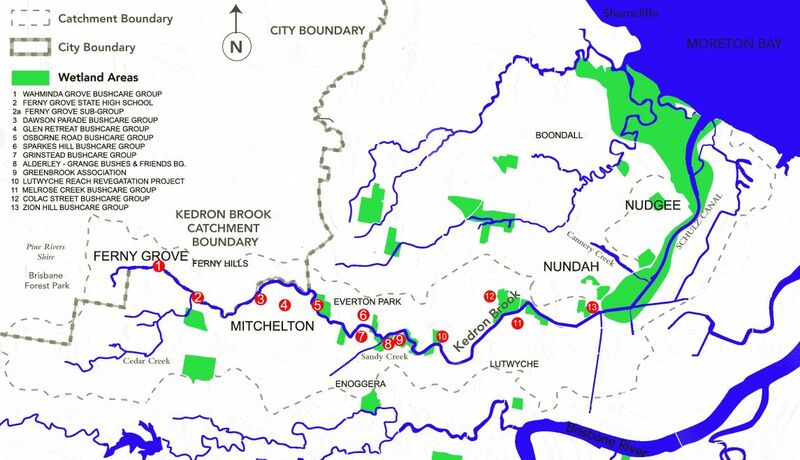 There are twelve Habitat Brisbane Bushcare Groups (BCC) operating in Kedron Brook at present*. Brook Park Bushcare Group operates fully within the Moreton Bay Regional Council (MBRC) bushcare group area. Wahminda Grove Bushcare Group works on an area shared by the BCC and MBRC (with Kedron Brook the separating border). As indicated above, Moreton Bay Regional Council (MBRC), assists two specific bushcare groups (as well as assisting or carrying out other significant forms of environmental care) within the western part of the Kedron Brook Catchment. More information on this matter can be found in the 'Environment' section of the MBRC website. Most bushcare groups meet mainly on the weekend once a month: though small groups generally have more flexible arrangements and adapt to availability of members and the season. When all seems lost, go to the 'Other Groups' page in the subsection of the 'Bushcare Groups' buttons above. Mainly of historical interest about past groups and bushcare locations, this page does point to some organisations that have interacted with the KBCN. The names of known groups below are listed geographically from the headwaters down to Moreton Bay. Use the links to find information about their bushcare activities and contact details. Note that the map site numbers on the location map do not always indicate operating sites*. Men of the Trees aims to carry out some tree development activity each week on a Saturday morning. See their web page on this website for details of their main work areas within the Kedron Brook catchment. These currently include Cedar Creek adjacent to the Ferny Grove bushcare group site, Keperra Picnic Grounds, Bob Cassimaty Park, Arbor Park, Thomsett Park, Camoola Street Park, and recently, Keryn Place Park. 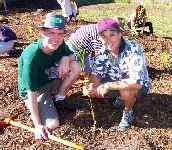 Brisbane City Council’s Habitat Brisbane program is a community and council partnership.The program has been developed for people who wish to be involved in protecting and restoring Brisbane’s bushland, wetland and waterway habitats. Kedron Brook catchment is in Habitat Brisbane's North Area. increased biodiversity through community efforts to protect and restore flora and fauna habitat . increased sense of community fostered through the ownership, achievement and community pride created by participants joining together. informed and provide opportunities to network with other Bushcare Groups. * Habitat Brisbane information sourced from BCC material.